Presentation | University of Cambridge – Matthew V. Bilskie, Ph.D.
Last week, I had the opportunity to give a talk at the University of Cambridge to the Cambridge Coastal Research Unit (CCRU). Much thanks to Anna for organizing the event! Abstract: Coastal regions around the world are susceptible to a variety of natural disasters causing extreme inundation. It is anticipated that the vulnerability of coastal cities will increase due to the effects of climate change, and in particular sea level rise (SLR). A novel framework has been developed to construct a physics-based storm surge model that includes projections of coastal floodplain dynamics under climate change scenarios. Numerous experiments were conducted and it was concluded that a number of influencing factors, other than SLR, should be included in future assessments of coastal flooding under climate change; e.g., shoreline changes, barrier island morphology, salt marsh evolution, and population dynamics. These factors can significantly affect the path, pattern, and magnitude of flooding depths and inundation along the coastline. 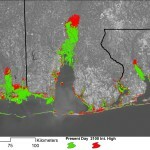 Using these factors, a storm surge model of the northern Gulf of Mexico, U.S. (NGOM) representing present day conditions is modified to characterize the future outlook of the landscape. This adapted model is then used to assess flood risk in terms of the 100-year floodplain surface under various climate change scenarios. The collection of results facilitate the estimation and projection of potential future flood risk. This novel method to assess coastal flooding under climate change can be performed across any coastal region worldwide, and results provide awareness of regions vulnerable to extreme flooding in the future.